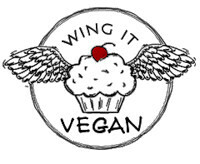 Wing It Vegan: Vegan MoFo - Shelly's Peanut Butter Cup Cookies! Vegan MoFo - Shelly's Peanut Butter Cup Cookies! Thank you for all the encouragement! You guys are the bestest! I promise I am done being a slowpoke and I will work hard at getting this e-cookbook finished as soon as possible! The mister and I celebrated Thankspiggin' a couple of Sundays ago, and now we're ready to celebrate Flakemas whenever we get the first good snow of the season. Flakemas will be all about celebrating the purdy snow, the cold weather, the purdy lights and decorations around town, eating festive cookies, gift-giving, and whatever fun stuff we feel like celebrating. There will be snowy movie marathons and plenty of hot chocolate and sweet treats! I like the element of surprise because we don't know for sure when the first good snow of the season will be. Bring on Flakemas! What's with all the made up holidays, you ask? Meh. I'm bored with all the traditional stuff. What I am not bored with is good food! Particularly cookies. Awful pictures, awesome cookies! I knew I wanted to make these as soon as I saw them on Shelly's blog, and I have already made them several times. 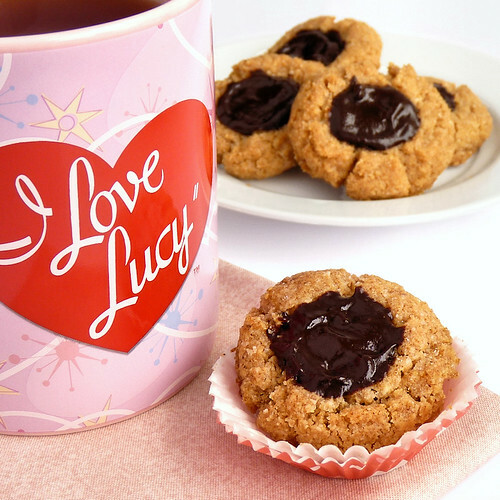 These ganache-filled, thumbprint Peanut Butter Cup Cookies deserve some major Blog-Love! I had to add some extra ganache because for some reason I was all prudish and dainty with the pre-baking application of the chocolate and they didn't have as much ganache as they should have. I felt pretty badass about making them with my own homemade peanut butter, brown sugar, and brown rice milk. You must make these cookies! You must! I'm telling you they're the bomb-diggity-bomb-bomb! Check out Shelly's recipe! PS: I'm thinking about writing a "Happy Post" that I can use to cheer me up whenever I have the mean-reds and I want to hide from the world. It would consist of a few of the things that never fail to make me laugh or at least smile. What do you think? Does that sound really cheesy or would you be interested in reading a Happy Post? Did you have to adjust the amount of whole wheat flour used? On Shelly's recipe it says something about how flour is milled differently where she is, but where is that? Any hints for us? I would love a Happy Post! I tend to like the same things as you (i.e. Gilmore Girls, I Love Lucy, Western scenery, and baked yummies) so it would probably be a Happy Post for me too! I would love a Happy Post. I could do with a Happy Post right now, in fact! Those cookies look so divine. I was ogling them over at Shelly's blog the other day. I just need to make it through until Sunday, and then I might have some time to actually think and sleep and bake - hurrah! You are so kitchen goddess cool with all your homemade ingredients too! I love Breakfast at Tiffany's. 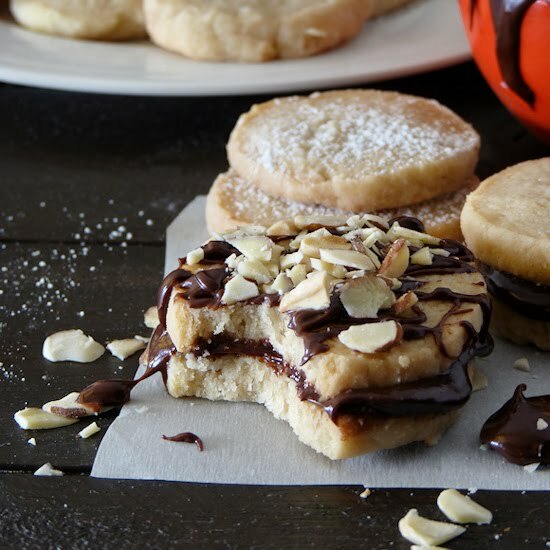 Peanut Butter Cup Cookies! Mug is super cute too... like I need it for every-day coffee consumption. Claire - I did what Shelly suggested and started with one cup, adding more flour gradually until I had a thickish/dryish dough. I'm gonna say somewhere between 1.5 and 2 cups? My peanut butter was VERY runny because I had just made it (I'm totally bragging about my homemade peanut butter again) so it might have absorbed more flour than a regular, more solid peanut butter would. I think everyone wants a happy post every now and then. I would love one, in fact. So, I had to reread Flakemas so many times...I kept pronouncing it Fla-kee-mas (kind of like fra-gee-lay in A Christmas Story). Awful pictures? Says who? I disagree! 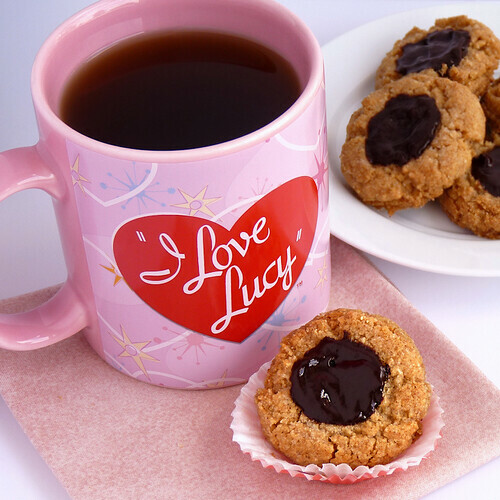 They make me want the mug AND the cookies. I say go for the happy post! I bookmarked those cookies but haven't had a chance to make them yet. They look so chubby and chewy. A happy post filled with silly cat pictures sounds about right. Today's picture and caption should absolutely reappear on the happy post. It sure made me happy. ha ha ha !! I LOVE that KITTEH!!!! oh my gosh, it is totally cracking me up. With 3 dogs and a cat, that is pretty much the story of my culinary adventures. Once I had some "anonymous" comment on a 6-month-old post that only said "if you blow up this picture, there is a cat hair on the avocado" Dude! cut me some slack! Yes to Happy Posts. Yes to PB & Chocolate cookies. Sorry you are feeling glum, I've been missing your excellent posts. xo! I think it's awesome that you've coined new phrases for these holidays and that you whipped up a Shellyfish recipe! You two are fabulous! Great cookies and a Happy Post sounds fabulous!! Happy posts? Yes of course. Love the cat picture. too cute! Of course I love the mug!!! You know what I like, Ms. River. Thank you for the very sweet things you said my dear, feeling very sentimental and warm and fuzzy about it all, really. I feel happy already! I'm so glad you're back and those mean reds have subsided. I was worried about not seeing you. There is nothing worse than feeling terribly when you don't know why. Bring on the happy post - and I'm with Andrea, with kitties! Definitely do a happy post. My baby animals post always makes me happy when I look at it so I do that quite often whenever I need a smile. Totally digging the Shelly love - that girl is très fabuleux for sure. And as much as I LOVE LOVE LOVE your flakemas it's a good job it's only a River holiday and not an official holiday 'cos it would never happen here. It never snows here. But I'll join you on the celebratin' cos I can do that.Even if I have to throw cotton wool about my head to make me feel like it's snowing. Nope, sorry - I totally noticed you were absent. It was like a big empty space in my inbox. But, all is forgiven for the awesome mug and cookies! Yum, they look so lovely! I am glad you are back, I have missed youuuuuu! And Shelly is the best, I love her blog too! Also, I want to see a happy post!